I'm working in Tooting at the moment and we have the most fantastic local greasy spoons, on top of the amazing curry houses. This picture is of Simon's Diner, in the car park of Wimbledon Greyhound Track. I love the decor and the portions are huge. 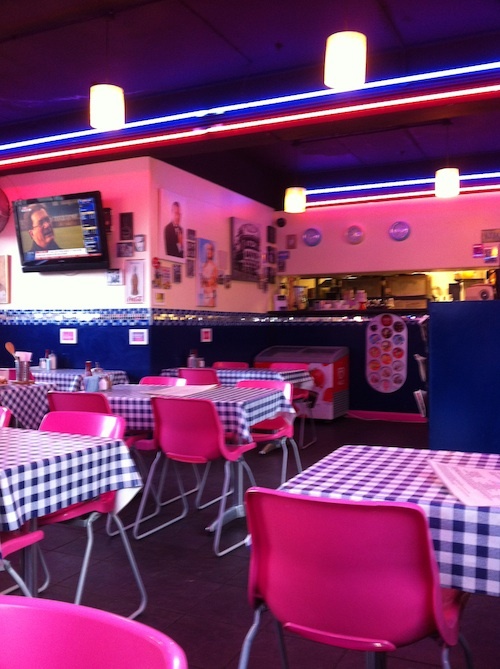 Also with huge portions and looking more like a traditional caff than an American Diner, is H's Cafe on Blackshaw Road. Both serve excellent, quality, no nonsense grub and both are unfortunately within 5-10 minutes walk of my office. On Saturday I attended the Ages and Stages conference, on intergenerational and more loosely community theatre. It was run by London Bubble, at the Canada Water Library. It was a real joy to hear such an interesting bunch of people talk about what they think community theatre's all about, including people I've found really interesting in the past - Lyn Gardner, Rosemary Lee, Helen Nicholson, who all lived up to expectation - and many others I've not come across before, not least people who've participated themselves. It also gave me a chance to re-examine my own thoughts: in the last nine years I've worked for five quite different arts organisations, I've completed an MA in Applied Drama and now for the first time ever (and this feels a significant milestone for me) I've started thinking about my own projects and how I'd like to shape them, as opposed to working to the ethos of an established organisation. Of course I chose those organisations because I thought I'd like how they worked, and I've learnt an awful lot from each, but it's different to be making it up for yourself. I ended up with about ten pages of notes at the conference (as the really interesting PhD student next to me said, "I can't write fast enough") and feel the need to process all that thinking and listening somehow, so here are some - only some of many - of the things which particularly resonated or threw up questions for me, not just about community theatre. Not conclusions, so much, as really just a list of thoughts, and as Helen Nicholson said, offered up humbly - and I hope I haven't misquoted anyone too appallingly. Many people minded the term "community theatre" and mainly in relation to the possibility they might be then called "community theatre makers" rather than just "theatre makers". Why? Because it feels derogatory? No one would think that by saying Frantic Assembly, for example, made "physical theatre" that that meant they weren't still "theatre makers". There was a nice feeling of inclusiveness though about the different kinds of practice that took place - and, albeit with some wariness about artists hopping on the bandwagon without really looking after the people they worked with (a good analogy was made by someone, I'm afraid I forget who, about some artists using people for inspiration and material without giving them any power, like you'd use 'a tube of yellow paint') - about the other practices which overlap with community theatre, like participatory theatre. Maybe still not enough with amateur theatre - yes, it's a different thing, but I don't think the line is quite as clear as some may think. I hope the RSC Open Stages project will have its intended impact on this. Community theatre is definitely gaining in profile, respect and status - I've sensed this and it felt confirmed at this conference. Lyn Gardner talked about social media's role in this in the context of papers like the Guardian reviewing community theatre. Increasingly, she said, it has a place in mainstream theatre criticism but this must be seen in the context of a "much broader changing cultural landscape where expertise is being questioned." She made the point that, for example, tweeters now often pre-empt newspapers at breaking news, meaning that papers now have to reexamine their function - and so do theatres. "For many years our dominant theatre culture was theatre made for but now theatre's place is at best questioned and at worst under siege. For or with is a big question now whether you're a theatre or a newspaper". I don't think I'd made this link before with why this change might be taking place, and it's a fascinating one. I liked the four panels - artists, commentators, participants, and finally one called 'not just the once' though this one seemed to digress into more general chat about very location based community theatre. Perhaps because everyone seemed to agree that infrastructure and longevity was useful, interestingly (I don't disagree at all but would have expected more of a debate about it). Should you select your participants in community theatre? Opinion was divided. Few thought auditioning in a traditional way was the right approach, most accepted the idea of having criteria if it worked for a particular show (of age, for example, or location) or picking a group which would be able to work well together. Making judgement calls as to whether projects are right for some people, however, was something not everyone thought directors should do (even if limitations on numbers meant some form of selection was required). Does involving everyone limit the kind of productions you can do, or how far you can go with your actors? In general I think I go with Rosemary Lee's approach: if possible everyone should get to do something but not everyone can do everything. It can be unfair on the individual and on the group. I can see this is tricky though: it relies on the selector's values and could easily be used as an excuse not to involve people who are more challenging to work with than others. It was great, having said all this, to have participants there, because all too often (and I think I'm very guilty of this) we think as producers and artists why a project is good (not necessarily just for us, for others too, but in a slightly worthy way maybe) and not why people might actually want to do this themselves, what their motivations were. We forget they are equal partners in the relationship, and I'm very aware most of my thoughts from the day are inevitably very much from my perspective not theirs. One of my favourite comments was from Helen Nicholson who pointed out some of the things people say (or have said in the past) about what makes great art are ridiculous - for example that it's "humanising". "How can you be more human?" She said we need to keep trying to be more precise at describing what makes things good - not at measuring it better, but at interpreting what's really happening. Rosemary Lee said that it wasn't skill or training she was looking for in her cast members - that people "unmasked" were beautiful, and training could interfere with this. Dancers who were like racehorses were harder for audience members to emphasise with. "Unmasked" became quite a buzzword for the day, I'm not sure that everyone used it in quite the same sense. I think there is something more to being "unmasked" on stage than just lack of training - as Rosemary went on to explain, a lot of her initial exercises are about making people feel comfortable in themselves and 'at home' - dropping the self-consciousness and 'front' that we all put on. I got the sense that many people felt an audience made up of friends and family of the participants was somehow invalid, or not the 'right' audience. I'm not sure why: presumably if community theatre has recruited well, the people in it will be a good representation of the community, and hence family and friends will be too. And maybe not likely to come to the theatre otherwise? Many thought 'new' audiences were important: at the other end of the spectrum, some thought that Guardian readers were not the 'right' audience because of this. This is still under quality, by the way, because I think it all has meaning in terms of how the quality a play is judged by its audience and what they're looking for. So, speaking of judgement and the Guardian… this all still comes under the quality question really but I feel the need to separate it. There seemed to be an agreement between some at one point during the day that community theatre practitioners not only wanted their work reviewed in places like the Guardian, but that they were happy that that would mean they were reviewed on the basis of the product alone, not the process. They thought their work should 'stand up' as a piece of theatre without needing to know it was created with a community. Even after Lyn Gardner admitted - well nay, insisted - that people should be aware that critics are reviewing a commodity. Others said that they weren't aspiring to the hegemonic values of mainstream theatre and therefore didn't want to be judged by them. I have to admit, my response to the former was "really? Really?" Yet I'm not sure I totally agree with the latter, either - the good reviewers, like Lyn, try and break away from hegemonic values, and I think that's quite old fashioned. You can't have it both ways - to want to be in the mainstream but be protected from what that means. I think I have several problems here which I'm not sure I've totally resolved for myself. Some projects are clearly of a very high quality, and rightly get reviewed, and get good reviews. To me this is a positive thing. I think community productions should be reviewed - and not just reviewed but critiqued in other ways too. If they're aiming for artistic quality - and most artists agreed they were - they deserve that recognition. However, to state the obvious: reviews can also be bad, and they're public. If a community production is bad, it's probably not the participants' fault (they're not in it because of their existing skill levels so it's been up to the director, and possibly writer too, to help them achieve their potential and craft a play which works with who they are) yet if they get a bad review they'll feel it's because they've not done well. Should those people be put in that position if that's not what they've signed up for? Does it depend on how and to what they were signed up? A few people said that it was important that a play was good so that the participants would be able to feel proud of what they'd achieved. I'm not sure I agree with that either. I think participants tend to be proud of what they've achieved if they've enjoyed making it, or if they've been challenged and felt they personally rose to the occasion, or for many other reasons and combinations of reasons few of which involve an unbiased view of the play and whether it was any good or not. Some of community theatre isn't very good, either. Of course lots of theatre generally isn't very good (as was said) but I have to be honest and say I do think less community theatre would stand up to the particular kind of standards of professional critics than many other forms of theatre - quite apart from anything else it's much harder, because you are balancing all sorts of priorities, and have limits like time, and how hard you can work your cast. Which is not to say, I hasten to add (again) that there isn't some fantastic community theatre out there which is at least as good as anything professional, or that there isn't much else of equal or higher value in those productions. This should probably really go under quality but I couldn't decide quite where to put it in the order and I do think it's really key. I think this links to the "unmasked" thing and is key to what makes some community theatre really great - yes in some ways the same rules apply to all theatre and what makes it excellent, but there is something in here about using "real" people which feels different. A reason why, perhaps, casting and selection should still be done carefully in community theatre so you're not shoving someone into a role which isn't right for them, which anyone could do and it wouldn't make much difference, but finding a way in which you can use everyone's natural talents to create a character which is uniquely their own. It's replicable: companies like Quarantine use real people to do this too, and it's key to clowning - the Lecoq school of clowning, anyway, and probably many great actors. But - at risk of going a bit arty - it's something about being real and present on stage, which it's easy to get wrong, but which I think is one of the things which community theatre has the potential to do really brilliantly that other theatre often can't. People, unmasked, real, and the beauty in that. It was a fascinating and inspiring day. 3. run up metaphorical mountains. I have a feeling this year theatre will make or break me. On the one hand, I’m going to be attempting to make a go of it as an independent producer (those words scare me terribly but if I say them often enough I might believe in them a bit more) and will be seeing as much of it as I can. I’m back in London and suddenly it seems as though a whole feast of delights has been laid on just for me. However on the other, this may give me indigestion: having got into indulgent habits as a staff member receiving free or cheap tickets at regional theatres I’ve already booked more tickets than I can afford for the first couple of months of 2012 and if I go on like this I may well be bankrupt before the year end. However, until that happens, I plan to enjoy myself. Here's what I'm seeing this month - I think this is the full list but you never can tell. Interesting in itself for being a rare co-production for the Royal Exchange, I skipped (figuratively. Literally I took the train) up to Manchester yesterday to start my theatre year with this entertaining show. In many ways not really my thing: quite apart from anything else, and I don’t know whether it’s just being from the newly attention deficit generation, I often find what you might call more traditional “plays” – scripted playwright-driven two-act-with-an-interval never-out-before-ten dramas – hard work. I wanted to see this because though recognising it as a very high quality production I was never quite grabbed by The Fahrenheit Twins but have always heard excellent things about Told By An Idiot. So, as I’ve said, I found it entertaining and often extremely funny; I really enjoyed some of the physical comedy, particularly Sophie Russell’s hopeless but fervent dancer, Essie; and the audience were enjoying themselves mightily which, you know, should be high up there as an important thing with something that's meant to be a comedy. Personally, still not quite convinced, but interested to see what comes next. This is tomorrow’s treat – I was looking for theatre which uses film and projection innovatively and someone suggested this on the new Guardian Culture Professionals Network. Diana Wynne Jones is probably my all time favourite author (if you haven’t read her yet, please do right now, and the book of this name, also adapted for film by Hayao Miyazaki, the director of Spirited Away, is a good one to start with) so I had to go anyway, but I also checked out some film footage of the creative team's last project The Ice Book and was intrigued. Haven’t been to Southwark Playhouse before yet either so all the more reason. I was given the opportunity to book for this, the end result of an intergenerational project about people who experienced the Blitz, alongside the Ages and Stages conference on intergenerational theatre. I’m going to that because I'm keen to do more intergenerational work at some point – excited, for example, that Rosemary Lee is on the panel as I thought Common Dance in 2009 looked like a really excellent piece of work – so this will be interesting. Well, I have to, don’t I, given any possible chance? After all the reviews about Mark Rylance’s performance in particular and what everyone’s said? And I almost left it too late. I’ve always been intrigued by how Kneehigh balance their really local origins – which still seem core to what they do - with being a professional and nationally (internationally?) successful theatre company. I’ve also wanted to see something by Little Angel for ages. I haven’t seen a lot of puppet theatre but would like to, and from what I’ve heard this should be really good. More and more I love physical theatre – if I was a performer myself this is what I’d like to do - and Frantic Assembly are so good at it. Have heard great things about Lovesong. The company are also dead nice. Not important for the quality of the theatre – arguably, anyway - but always good to know. I don't know that much about dance (though this isn't a dance piece, by the way) but I do know Shechter is a brilliant choreographer: I saw a couple of his pieces in Plymouth. I was impressed by the total muscle control of the dancers and exhilarated by the music. I also really liked the way he thinks so carefully about the audience experience of the work as well as the work itself: he uses very simple things like house lights and blackouts to manipulate this so that one moment it is as though you're watching a film and the next you're ultra aware you're in a theatre with a live experience. More recently I really enjoyed his audio piece for Fuel’s Everyday Moments series, in collaboration with the Guardian: I really recommend experiencing it particularly if you quite enjoy dancing with your eyes shut and losing yourself to the moment. You can also read what he says about it here. So, this musical collaboration with Gormley is a step in a different direction which I’d like to hear, though I’m not sure if I’ll be able to this time round, at least (the money thing again, oh and time). Mainly because I read a lovely article on Exeunt by Tom Frankland on working with his father. Again I’m not sure I’ll make it, but I’ll be sorry not to. Baker Street is obviously most famous for its associations with Sherlock Holmes and I'd almost forgotten there was a tube station there until being driven past it last week and coincidentally also dropped off there today, returning from Oxfordshire where I'd been for New Year's Eve. 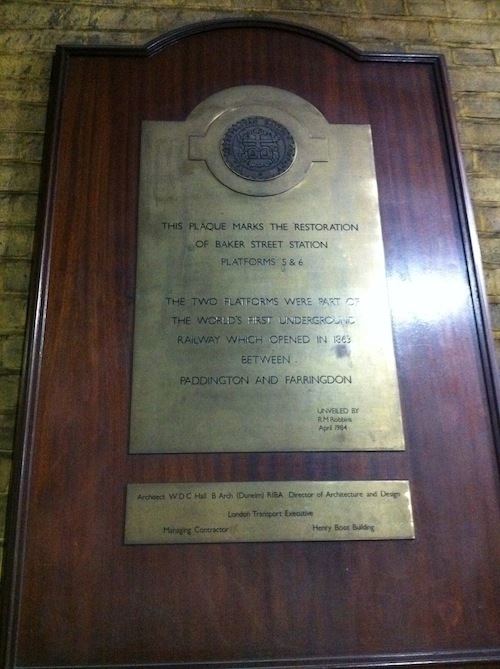 I spotted this plaque on the wall and it reminded me that however much I hate the tube sometimes, it's pretty amazing that here we are, still using the world's first underground railway. 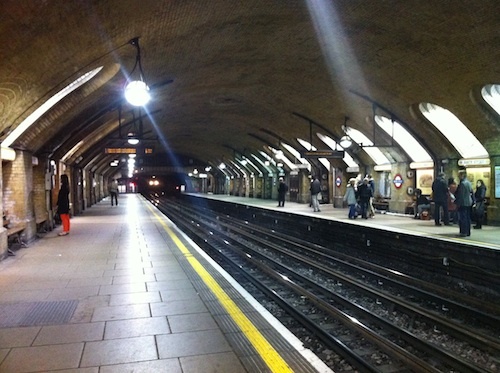 This platform, now home to the Circle and Hammersmith & City lines, is the oldest at Baker Street tube station, which was originally built for the Metropolitan and St John's Wood railway (now of course the Metropolitan Line) and was later also a terminus for the Baker Street & Waterloo railway: now the Bakerloo line. For comparison there is a nice chromolithograph of the platform as it looked in 1863 here.